Education reform at primary, secondary, and university levels in Chile is a longstanding social and political issue that has now forced President Sebastián Piñera to reassess the country’s antiquated and class-ridden education system to meet the expectations of students. In a collective effort aimed at widespread reform, protesters have demanded greater transparency and state control, and above all, have insisted upon quality education without high university tuition costs. While the Piñera administration’s attempts to pacify protesters have led to further social unrest, the nation and its students await an acceptable agreement to be reached. After approximately three months of school takeovers, strikes, and nationwide marches throughout Chile, the unflagging persistence of demonstrators may prove decisive in the ongoing fight against unjust education standards that has taken the nation and its administrative cadres by storm. Years of extreme discontent with the Chilean education system have driven students and teachers alike to demand national education reform that would ultimately ensure a quality, affordable education for all. The latest demonstration took place in the nation’s capital on August 21and involved over 500,000 protesters, contributing to the mounting political pressure on the Piñera administration. Braving the police force’s water cannons, tear gas, and anti-riot gear, hundreds of thousands of students, teachers, and sympathizers are stomping throughout Santiago and other cities, applying pressure on the Chilean government to respond to their demands. The Chilean school system has been subject to acrid criticism and student protest since the initial decentralization and partial privatization of primary and secondary schools in 1981. Under the harsh dictatorship of Augusto Pinochet, funding for university level education dramatically decreased. Accordingly, universities were obligated to counter the shortage of funds with higher tuition fees. The dictatorship adhered to the neoliberal belief that students should essentially “pay for the private returns they got from their investment in higher education” and the perception that universities would become a perilous political threat to Pinochet and his regime. In conjunction with the establishment of for-profit, private universities, the lack of comprehensive reforms for university level education following Pinochet’s regime has divided prospective students on the basis of personal wealth, creating a sharp disparity in the quality of education a student receives from private versus public schools. The underlying cause of Chile’s protracted education system issues stems from the reality that the constitution does not explicitly mandate the state to provide quality education to its citizens. The neoliberal model that exists in Chile has exacerbated problems in the education system because of the establishment of subsidized and private primary and secondary schools, which created competition for state funding with public schools. In addition, while reforms have established a greater number of private, non-profit universities, they have yet to address core structural issues and have instead deepened inequality and social segregation. 3,000-person choreographed performance of Michael Jackson’s ‘Thriller’” to imply that Chile’s education system is, without a doubt, dead. To regain the country’s trust, Piñera proposed the Gran Acuerdo Nacional por la Educación (GANE), pledging USD 4 billion for student scholarships and loans, yet the pitch still left dissidents unsatisfied. GANE called for a total investment of about USD 10 billion, a considerable amount for a country whose annual national budget for education is only USD 11.5 billion. The proposal also required the legalization of for-profit colleges, which raised concern amongst protesters over the government’s intent to use the education system for profit. Following Piñera’s GANE proposal, Minister of Education Felipe Bulnes introduced a 21-point plan on August 1 that students also rejected and considered “nothing radical or extraordinary.” The proposal entailed greater monitoring of public school academic performances, greater funding for traditional public universities, and additional financing for higher education commensurate with performance and development. In a similar reaction to the GANE proposal, protesters deemed Bulnes’ plan unsatisfactory and ambiguous. On August 16, after several meetings with Bulnes, Piñera issued a new proposal in hopes of easing the restlessness of Chilean student protesters. In response to student petitions for free education for roughly 70 percent of Chilean students, the president’s new proposal promises more federal scholarships to low-income students and a reprogram of college credit. Moreover, eligible students would be granted full or partial waivers for accrued penal interest from government loans. While students have yet to react to this newly-proposed initiative, it is certain that they will continue to require more details as to how the government plans to improve and finance the nation’s education system. For the past few months, Chile’s aspirant youth — a rising political class — have expressed their grievances about the country’s inherently flawed and structurally unequal education system and about a president who fails to respond to their demands. Fearless citizens have participated in organized protests and hunger strikes to raise awareness for their cause. On August 4, during one of the most violent protests to date, police attempted to dispel the thousands of protesting participants with tear gas and water cannons. Approximately 900 people were detained while a handful of police officers and protesters were injured. The aggressive, yet understandable demonstration led to the eruption of flames throughout the capital and the loud banging of pots and pans in the streets, proving to the nation that even repression will not undermine the overarching student movement. What began as a fair warning to the Chilean government of the students’ demands pertaining to all education levels has now transformed into an unrelenting political force that calls for constitutional and structural reform. At all levels of education, today’s student protesters fervently challenge market-driven, for-profit, public schools and universities. Meanwhile, university students also take issue with the government’s management of student loans and the lack of equity in the university admissions process. Further demands include scholarships for lower and middle-class students and year-round bus passes. After numerous hours of failed negotiations between interior minister Rodrigo Hinzpeter, teachers’ union leader Jaime Gajardo, and president of the Federation of Chilean Students (FECH) Camila Vallejo, plans for further demonstrations and strikes remain unchanged. With labor unions like the Central Unitaria de Trabajadores de Chile (CUT) and prominent leaders like progressive leftist Marco Enríquez-Ominami of the Partido Progresista de Chile supporting the protests, the Piñera administration faces increasing pressure to resolve political unrest. This additional support from labor unions and their leaders is an impetus for the ongoing movement and places students in an advantageous position for demanding constitutional reform. The continuing protests are forcing the government to develop a fair and effective solution that meets the demands of the politically marginalized. Conclusion: Is it all Worth the Fight? While the government is finally starting to recognize the country’s youth as a politically influential and relevant faction, the impact of the current education reform protests remains to be seen. Piñera proclaimed that it is time to “move forward from diagnosis to solutions, from protest to action.” Despite the president’s declared commitment to progress, the government’s futile efforts to pacify demonstrators indicate that protesters will not withdraw until quality education is a guaranteed right for all Chileans. The administration’s failed attempts at negotiation with student leaders thus far show that the conflict will not be resolved in the near future. With the sweeping social movement and its needs unfulfilled, the only assurance for the future is that Chile’s economy remains unscathed. Financial analysts like Enrique Alvarez of IDEAglobal agree that international markets perceive Chile as a nation with “a stable, credible economy,” and it is highly unlikely that the student protests will be a detriment to the nation’s economic status. Is the violence that has ensued from student demonstrations worth the fight? Reports from the Inter-American Commission for Human Rights condemn Chile’s police violence and government repression. There is no question that the government’s attempts to quell protests violate students’ constitutional right to free speech. Countless lost hours of teaching and learning, hundreds of arrests and injuries, and more than USD 2 million in damages later, the Piñera administration still struggles to reach an agreement with student leaders. The ongoing education reform reveals flaws in Chile’s democracy and the government’s paralyzing incompetence in addressing these challenges. Threatened by often violent protests and demonstrations resulting in damages and threats to national tranquility, the government now seems willing to embark on a path toward instituting a series of constitutional reforms. There is no indication that the unwavering coalition of students, teachers, and sympathizers are backing down. Protesters have gone to extreme measures by participating in school takeovers, demonstrations, and even hunger strikes to warn the government that the movement will not falter until its demands are met. 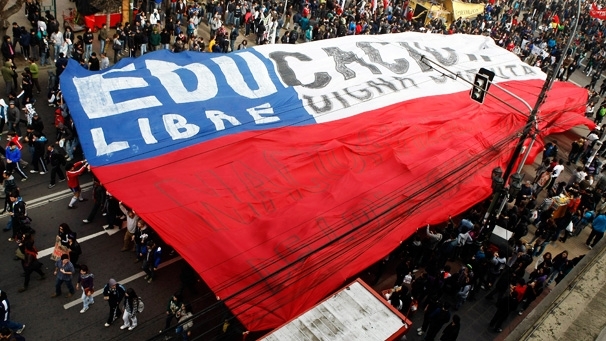 As the nation waits, in observance of this historic movement unfolding before their eyes, the efforts of Chilean protesters who seek a national education reform for greater access to educational opportunities and a brighter future for Chilean youth will no longer remain unnoticed.